Pentax has started off the year by launching two new digital compacts. 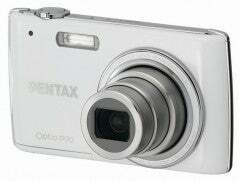 The most exciting arrival is the 12 megapixel Optio P70, which is £179.99. As well packing in this high resolution, it also records movie clips at 1280×720 pixels. Also worth a mention are its 4x optical zoom lens which delivers wide-angle coverage and a focal length from 4.9mm to 19.6mm (equivalent to approx. 27.5mm to 110mm in 35mm format). For higher-magnification photography, the P70 is also equipped with an Intelligent Zoom function, which extends the zoom range to approximately 25x. Other key features include its triple anti-shake protection, Vertical Snap mode which is claimed to make it easier to shoot with the camera in the vertical position, including automatically rotating all of the icons on the LCD monitor. The P70 is also ultra slim thanks to its sliding lens system. Next up is the entry-class Optio E70 digital compact which is claimed to be perfect for those who are new to digital photography. Features in this 10 megapixel snapper include Pentax triple anti-shake protection; Auto-focus and Auto-exposure modes capable of recognising up to 32 faces in 0.03 seconds. There is also a Green Mode (strangely – nothing to do with eco concerns) which gives the camera responsibility for making all the necessary technical decisions. The Optio E70 also uses AA alkaline batteries, has large control buttons and seven shooting modes. No price as yet though. For more information, visit Pentax UK’s website.